Gastric cancer is the third prevalent cause of cancer deaths worldwide and remains a disease with high mortality. Advanced gastric cancer frequently has a poor prognosis as it is resistant to many of the conventional chemotherapeutic strategies. Average age at diagnosis is 69 years, and the risk is slightly higher in men than in women as per the American Cancer Society. Preclinical studies of the Hs746T mouse xenograft model are essential in the evaluation of anti-cancer treatments related to gastric cancer progression. The Hs746T epithelial cell line is isolated from a 74-year-adult Caucasian male patient with gastric carcinoma. The Hs746T is a hypertriploid human cell line that is tumorigenic in immunosuppressed mice. In a 2017 Hs746T xenograft study published in Investigational New Drugs, merestinib alone or in combination with emibetuzumab was evaluated in vitro and in vivo in mice with Hs746T xenograft tumors. Merestinib is a type II MET kinase inhibitor that inhibits the proliferation of Hs746T cells in vitro, a suitable therapeutic option for treatment of patients who progress on type I MET inhibitor treatment. Also, the combination of merestinib with emibetuzumab when patients progress on single agent merestinib could be beneficial according to the study. A 2016 study by Hughes et al. 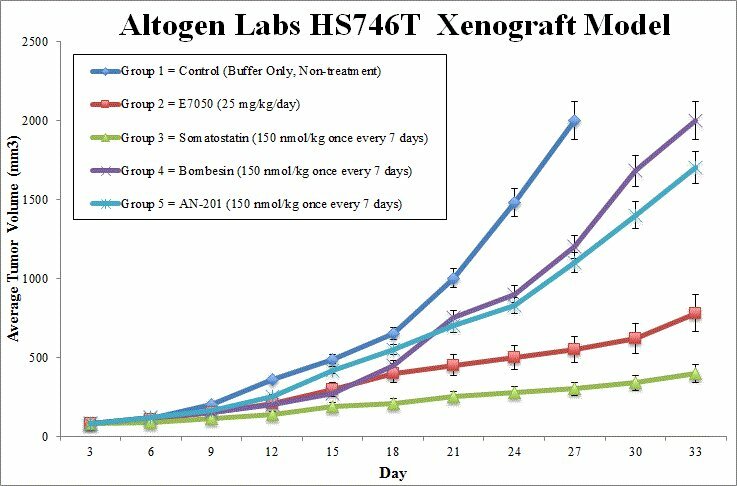 used a Hs746T xenograft model to test AMG 337, a small molecule MET receptor tyrosine kinase inhibitor. Results demonstrated AMG 337 decreased proliferation, inhibited MET, phosphorylation of the adaptor protein Gab-1, and the downstream MAPK and PI3K pathways. Gavine et al. (2015) also used Hs746T xenografts as a model for examing c-Met inhibitors; in this study volitinib, a small molecule tyrosine kinase inhibitor, was highlighted as a selective cMET inhibiter which provides rationale for clinical use treating gastric cancer. Park et al. (2016) is the last example of a study that used a Hs746T model, once again for its overexpression of c-Met; they presented the novel inhibitor KRC-00715 as a potent and selective c-Met inhibitor which exhibited cytotoxicity, inhibition of growth in the c-Met oncogene addicted Hs746T model, and reduced Akt and Erk activities. The Hs746T cell line (human gastric) is used to create the CDX (Cell Line Derived Xenograft) Hs746T xenograft mouse model. The Hs746T xenograft model allows researchers to study small molecule compounds that inhibit signaling pathways (e.g. c-Met and VEGFR-2) that contribute to tumor malignancies (such as volitinib). Exponential growth is maintained for all flasks. Cell count and viability is determined after collecting all cells via trypsinization. Following a trypan blue exclusion test (req 98% viability), cell suspensions are adjusted to the required density for inoculation. One million cells of the Matrigel+Hs746T suspension (vol = 100 µL) is injected subcutaneously (s.c.) in the hind leg per mouse (NOD/SCID, 10-12 weeks). The injection sites are continually observed for palpated tumors. Digital calipers are employed for measuring tumor size, until average sizes of the tumors are 50-150 mm3. After randomization into treatment cohorts, test compounds are then administered and the agreed upon treatment schedule is followed. Tumor measurements are recorded (daily) along with documentation of mouse weights 3 times weekly. At the end of the study, as the tumor size limit is reached (or 2,000 mm3), the animals are euthanized. As discussed for end of study, a necropsy is then performed. Tumors are removed and tumor weights logged. The excised tumor is digitally imaged. The list of predetermined tissues are collected and either 1) submersed in RNAlater, 2) snap frozen, 3) nucleic acids isolated, or 4) prepared for histological analysis.